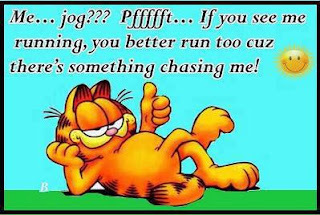 Here we have some standard jokes often seen on Facebook, imgur, or Pinterest concerning running. For my entire life running has been nothing but an enjoyable experience for me, and I guess I should be grateful that it has been. As mentioned in the previous blog post, one of my earliest memories involves racing my dad and brother around our house. My dad got my brother and me started with sprinting short distances and racing each other basically as soon as we could walk. In addition, our grandpa started us on long-distance running very early in life. My grandpa Monnin was a marathon runner. As a side tangent, he has won more races than anyone I know. 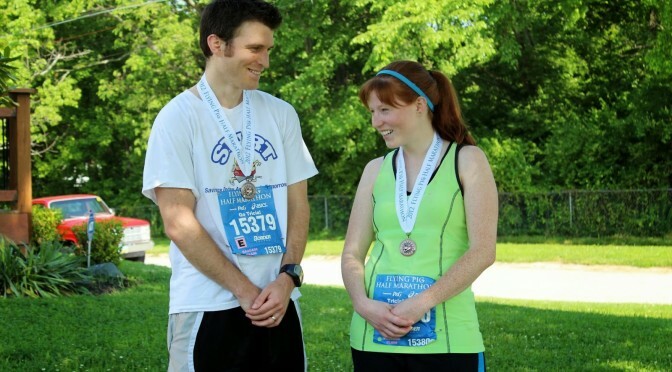 He won 1st place in his age group for the Columbus marathon when he qualified for the Boston marathon. If you should ever find yourself at his house, and it is your 1st time there (or 2nd, and then 3rd, like D), he will undoubtedly gesture towards the basement, and mutter, “Come on, I have somethin’ to show ya.” He will then bring you downstairs into his trophy room and dazzle you with more trophies and medals than you have ever seen. The truly amazing thing is he could sit there and tell you a story to go with every single medal and trophy; he remembers. Seeing the trophy room has been an initiation for all significant others who have had the pleasure of coming over to Gma and Gpa’s house. 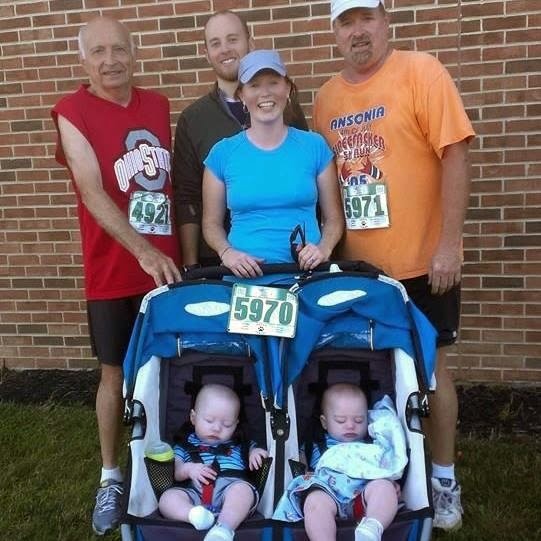 So, when I was about 6, making my brother about 9, my grandpa Monnin started training him for a 1 mile fun-run in Piqua, which all my cousins and I also ran for our very first race. It was a sort of rite of passage with Gpa. To help my brother train for this race Gpa came over to our house, drove 1/2 mile down the road, grabbed a gallon of orange paint, dumped a glob on the road, and told my brother to run to there and back. I love when he does crazy things like that. That glob of orange paint stayed on the road for a long time, and I remember also using it as a run marker. 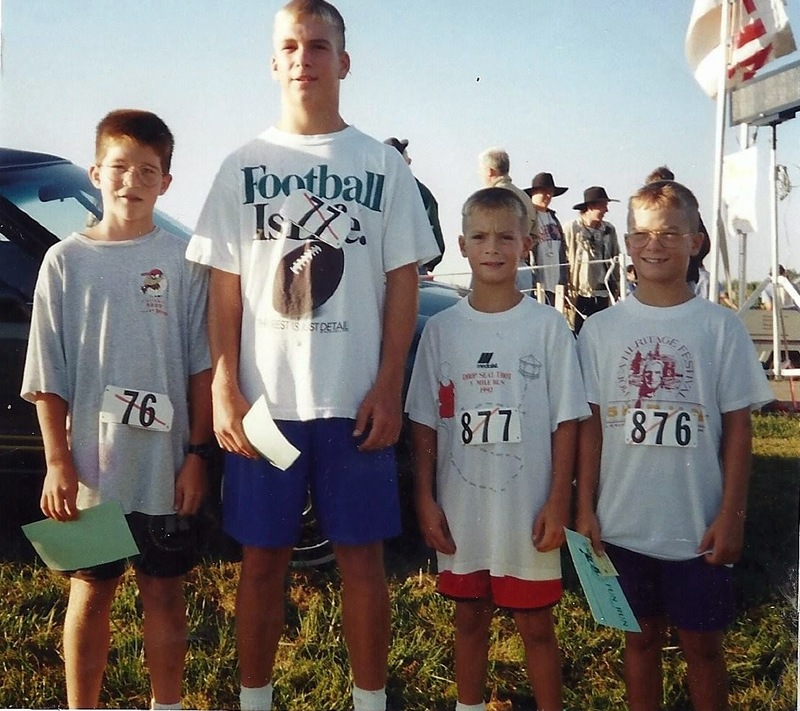 Then in 6th grade, something happened that had a huge impact on why I run today. Our science teacher, probably my favorite 6th grade teacher, had us playing a game of ‘2 truths and lie.’ As a truth, I threw in that I was running a mile a day with my grandpa. Our 6th grade science teacher was the high school and junior high cross-country coach. When my statement was revealed as a truth, he immediately recruited me for his cross-country team. I figured if this guy could make science fun, he could probably make running pretty fun too. Plus, I just wanted to be a runner like grandpa. Though nothing contributive came out of that recruitment for the coach, I am forever grateful I ran cross-country for 6 years. There were obviously the serious runners and then there were the “social” runners, which was the category in which I immediately and happily placed myself. Every practice for me was a chance for a great conversation with another one of the more “social” runners. Anyone who knows me well would understand my feeling of, “how could I not love that? !” Running with the CC team taught me 3 things: Endurance, pacing, and lastly and most importantly, that running can be an enjoyable experience. Not only did I have awesome and entertaining teammates, but also an AMAZING coach who made every practice new, fun, and adventurous…for 6 years. All through college, I used running as a way to make new friends, catch up with friends, and of course attempt to knock off the freshmen 15. Fast forward eight more years, and now I live in California! What is different about running in California? It is always running weather!!! In Ohio, some might say (except for Grandpa, of course) that running is contingent on weather or treadmill access, but for the past two years I’ve lived in San Jose, it has not yet been too cold, too wet, or too icy to go running! Granted, the last few weeks of summer have brought rather hot days, where one would prefer to run at night, but it is never nearly as hot as it was when I left Cincinnati. Another thing different about running in California, for me, are the running trails. You can usually reach a paved running trail from wherever you live, which is shaded and not cement, so it’s amazing, but occasionally we’ll drive out to do some trail running at a place called, “Rancho San Antonio.” You basically run up a mountain, and then back down again, but if you have an amazing husband who will agree to push and pull you up the mountain like mine does, then it’s really not that bad. 🙂 Also, when you get to the top, you get to see amazing views of the Bay Area. 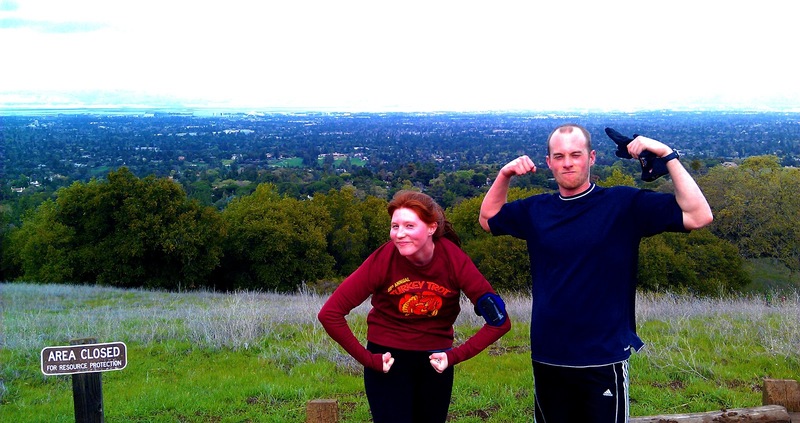 Sean took this picture of D and I at the top of Rancho in March of 2012. 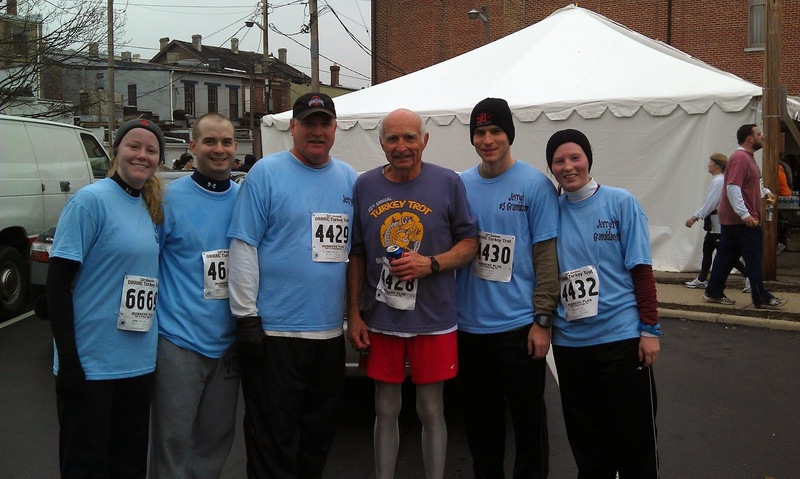 This picture marks the beginning of my half-marathon training for the Cincinnati Flying Pig. My brother told me at Christmastime if I wanted to fun (whoops, Freudian writing) the half, he would run it with me. Then, D started running ridiculous distances to train for Tough Mudder, and I didn’t want to be left in the dust when I showed up in Cali, so I would try to run however far D told me he ran. Pretty soon into doing so, I realized I might as well keep it up, and start training for the Cincinnati half. So, I called my brother and took him up on his offer. Training with my brother was probably one of the most fun experiences I’ve ever had running. Now, I’m usually known to be behind the times, and I had refused for the longest time to listen to music using ear buds because I learned in all my audiology courses how ridiculously terrible ear buds are for your hearing long-term. But then I discovered early into my half-marathon training that running with music actually changes the entire experience. Music gives me the power to run twice the distance I was planning to run, in faster times! Plus, I figured out pretty fast that if you run somewhere where you’re not bothering other people, you can just listen to the music via your phone speakers and not destroy your hearing. I love listening to music so much that sometimes I find it hard to get out of my car because the radio DJ is doing an incredible job playing my favorite songs back to back. Well it turns out, if I take those same songs and put them on my phone to listen to while I’m running, I then find myself wanting to run longer and longer just to keep listening to my playlist! It rocks! So my brother and I would meet once a week for our long run and listen to running playlists that ranged from Lion King to Disturbed. The whole time we ran we would be singing and dancing along with the songs. Not only was it the most fun running ever, but it also had to have improved our lung capacities. To summarize “why to run,” I think a good reason to run is because it has the power to be an enjoyable experience, and also provides a good chance to bond with people. If the word, “run,” is too daunting, then why not walk? Now “how to enjoy yourself” during this process is to find your best friend, your significant other, or someone you’ve been meaning to catch up with for a long time, and ask them if they might want to go for a run or walk. Find your favorite music that gets you pumped, and just let loose. I do not run for the reasons most people assume one would run. I do not run because I am in some kind of amazing shape that classifies me as “a runner.” I do NOT have a “runner’s body.” I was built short and stout. I run because I always have fun, I always feel incredibly pumped while doing so, and I always get to have the feeling that I accomplished something after every run. It is great aerobic exercise, which is important for telling your body to grow, not decay; to gain muscle, not fat (our bodies read active days as springtime hunting and inactive days as wintertime starvation). Therefore, it will keep you healthy (healthier) for as long as you do it. Doing it 4 days a week for an hour would be perfect, and it doesn’t have to be a hard workout. 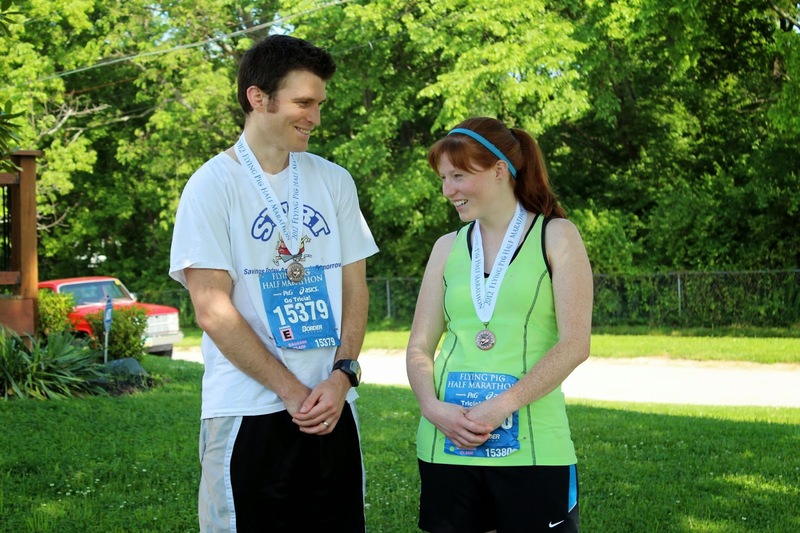 Get your shoes on, grab a friend, and have a casual chat as you run at a casual pace.